STRASBOURG, France, January 16, 2014 (ENS) – The European Parliament took action against elephant, rhino and tiger poaching Wednesday by passing a resolution on wildlife trafficking that calls for moratoria on ivory trade and other measures against wildlife crime across the European Union. An overwhelming 647 MEPs voted in favor of the Resolution on Wildlife Crime, while 14 voted against. The resolution expresses the Parliament’s view that wildlife trafficking is a serious economic, national security, and environmental threat. To stop the ongoing crisis of species loss, the resolution calls on the 28 EU Member States to introduce their own moratoria on all commercial imports, exports and domestic sales and purchases of tusks and ivory products until wild elephant populations are no longer threatened by illegal killing. The resolution calls for the European Commission to establish an EU-wide action plan against the black market trade in wild animals and their parts. The resolution recommends better prosecution of perpetrators of wildlife crime and on-the-ground protection for elephants, rhinos, tigers and other species. The measure refers to the statement of 11 African elephant range states at the September meeting of the Clinton Global Initiative in New York, which urged countries to declare national moratoria on any trade in ivory because of the crisis. The resolution was piloted through parliament by Dutch MEP Gerban-Jan Gerbrandy of the Group of the Alliance of Liberals and Democrats for Europe. The measure passed parliament’s Committee on the Environment, Public Health and Food Safety in November 2013. “Europe cannot lag behind anymore. 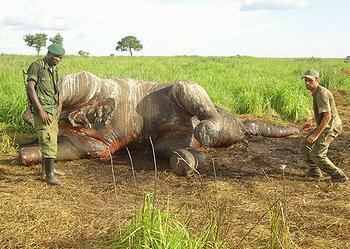 We have to stand up against illegal poaching,” he said. Environmental groups were pleased with the parliamentary action. “This landmark resolution passed by the European Parliament shows the rising amount of global concern for the toll that the ivory trade is taking on wild populations of elephants,” said John Calvelli, executive vice president of public affairs with the New York-based Wildlife Conservation Society, which operates the city’s zoos and aquaria. “We would also like to see this resolution serve as impetus for similar action in the United States Congress,” Calvelli said. 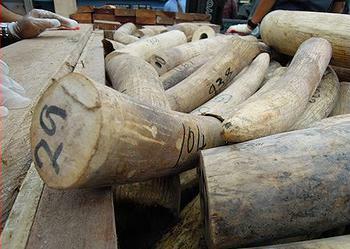 African elephants are being lost at an unprecedented rate and the demand for ivory shows no decline. About 35,000 elephants were killed by poachers last year, amounting to some 96 elephants every day of the year. The global conservation organization WWF and its wildlife trafficking monitoring branch TRAFFIC strongly support parliament’s decision to adopt the resolution on illegal wildlife crime. The next step towards that goal will come in February when British Prime Minister David Cameron hosts a London summit on illegal wildlife trade that is expected to attract wildlife experts and heads of state from around the world. The European Commission is expected soon to release a new Communication on illegal trade in wildlife, timber and fisheries, and to present it at an EU Conference in April in Brussels.